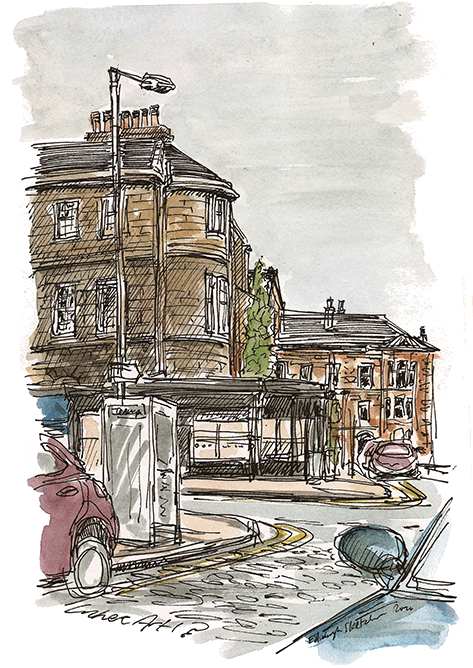 Do you recognise my sketch this week Edinburgh? This is the junction of Ferry Road and Summerside Place, as seen fro Trafalgar Street in the north of Edinburgh. This weeks first three were: Lizzie Rynne, Dunedinhen and Ronald OMalley. Sorry to be late, busy morning but yes I agree, junction of Trafalgar Street, Ferry Road & Summerside Place. Sorry, I’m not sure I get the reference to Jamacia Street?? junction between ferry road and summerside.
? Bonus point for knowing that street sign above blue fascia is Jamaica Street? I think this is on the corner of Ferry Road/ Summerside Place. The sketch make it look very nice!!!! Is that the corner of Stafford street and Alva street?